A lecture by Merilyn Spier on Arts and Crafts Architecture in the USA concentrating on Gustav Stickley with a brief mention of other East Coast architects, early works by Frank Lloyd Wright, and examples of California Arts and Crafts buildings. Merilyn is on the Council of ACMS and is a former Chair of the Guildford Society. She has practised architecture in both the USA and UK, has occasionally lectured on architecture and is currently a Guildford Borough Councillor. An illustrated lecture by Maureen Dillon which will consider thoughts on domestic lighting and the design of light fittings by leading Arts and Crafts Movement designers. Particular attention will be paid to the work of , which will be compared to the fittings produced by manufacturers. Maureen is a member of the National Trust Country House Technology Survey team and Adviser on Historic Lighting to the National Trust. Also an author, her most recent publications include Artificial Sunshine - a Social History of Domestic Lighting, published National Trust, 2002. John George will lecture on the sources and influences that led to the emergence of the Arts and Crafts Movement which will be explained through the art and architecture of the early 19th century and the religious, economic and social environment of the period. John George trained and practised as a meteorologist before a business career in marketing and management. During the ‘70s and ‘80s he worked for an education trust through which his interest in architecture, craft and design developed. John is a trustee of the British Architecture Library and a founder and chairman of the Society. The publication of a new book Gardens of the Arts and Crafts Movement by Judith Tankard and the occasion of her visit to London this month, has provided the opportunity for an event at Gravetye Manor in Sussex. Now an exclusive hotel with Michelin Star restaurant, the beautiful sixteenth century Elizabethan manor, situated within thirty acres of historical gardens, was the former home of William Robinson from 1884 until his death in 1935. Robinson was one of the most influential authors on English gardening, and his books The Wild Garden and The English Flower Garden laid down the principles that revolutionised the art of gardening. In the garden at Gravetye he put into practise his belief and ideas about garden design, pioneering the natural garden. Judith Tankard lives in Massachusetts and is an architectural and garden historian and a highly regarded teacher at the Landscape Institute, Harvard University. She is founding editor of The Journal of the New England Garden History Society and the award-winning author of several books on garden architecture. Her current book features the gardens of Sir Edwin Lutyens, C.F.A. Voysey, Gertrude Jekyll, Ellen Shipman, Charles and Henry Greene, and other Arts and Crafts designers, who created some of the loveliest of manmade landscapes. Illustrated with period watercolours and drawings, and with new photographs and garden plans made especially for this publication, the book promises to be an important resource for art and design historians, and a delight to all lovers of gardens. We shall spend a sociable afternoon with Judith, in a beautiful setting hearing about the background to the book and her researches and learning about the subject of one of its chapters, William Robinson and his garden at Gravetye Manor. We shall look at the period paintings of Gravetye which survive at the Hotel and, weather permitting, venture into the grounds with Judith to see some of the garden features. We hope to have copies of Gardens of the Arts and Crafts Movement for sale which members may wish to have signed. This event will provide an opportunity for members to view a collection of architectural features rescued by Charles Brooking and now on display at Cranleigh. The exhibition is arranged in chronological order in a series of outbuildings and is an Aladdin’s cave of treasures. 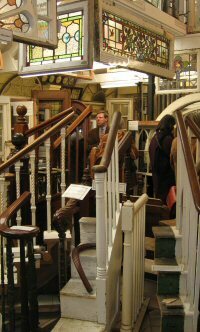 As at the principal ‘Brooking Collection of Architectural Detail’, a unique educational and reference source held by the University of Greenwich, there are windows, doors, stained glass, sections of staircases, balusters, fire grates, rainwater heads, together with door and window ironmongery and sample lengths of architrave and skirting mouldings. 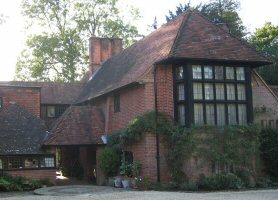 The collection at Cranleigh places more emphasis on Surrey vernacular styles and on the Arts and Crafts Movement and includes items designed by Norman Shaw, Sir Edwin Lutyens, CFA Voysey, Thackery Turner and Henry Woodyer. The Brooking Collection is unique, and its value is acknowledged by leading architectural historians and architectural practices that specialise in restoring historic buildings. Charles regularly conducts lectures for students and professionals in the fields of conservation and restoration as part of their programmes of Continuing Professional Development. Charles will guide members around the display explaining the history and function of the artefacts. Rake Manor (formerly Rake House, the home of the owner of Rake Mill — hence Milford) is a fine brick and timber building of c.1600. From c.1880, what is now Rake Court was gradually added to the old house to form a Kitchen wing, together with a Billiards/Music Room. The architects for these additions were successively Ralph NevilI (1882), Sir Edwin Lutyens (1899-1902), M H Baillie Scott (1906-1930), Raymond Cary (1936) and Martin Car�e (1987). There will be a small exhibition, arranged especially for our visit, of Cartoons and Caricatures — some minor works by some major illustrators: Sir Max Beerbohm, Alfred Bestall, Hercules Brabazon Brabazon, Peter Brookes, Alfred Bryan, Sir Hugh Casson, Harry Furniss, Gertrude Jekyll, Sir Osbert Lancaster, David Langdon, Sir David Low, Phil May, William Heath Robinson, E H Shepard, A A Shepperson, S C Strube, Sir John Tenniel, Archibald Thorburn and Vicky. Alan Bott will talk about the history of the house before introducing the exhibition of cartoons and caricatures. There will be time to view the drawings closely and a tour of the exterior of the house and of the ancillary buildings by Ralph Nevill to discover the organic way in which the estate grew. We shall also walk round the lake and see the garden, where it is hoped the daffodils may be blooming. 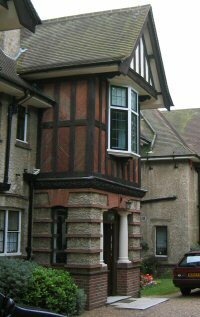 Society members Christine and Tim Cookson have generously arranged a programme to visit some of Eastbourne’s early 20th century Arts and Crafts influenced domestic architecture designed by Sir Edwin Lutyens (1869-1944) and local architects Peter D Stonham (1876-1942) and Richard Goulburn Lovell (1861-1937). 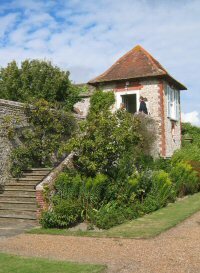 The day will include a rare opportunity to visit The Hoo at Willingdon, a property substantially altered in 1902 to designs by Sir Edwin Lutyens, including the laying out of a large terraced garden with many characteristic features. There will be an opportunity to view some of the best examples of good quality domestic architecture of the early 20th Century in Eastbourne by prominent local architects. Visits have been arranged to the Park Close by Lovell and Stonham, South Lynn Drive and the Torfield Estate by Stonham. These properties illustrate the continued influence of the Arts and Crafts Movement during the interwar years. 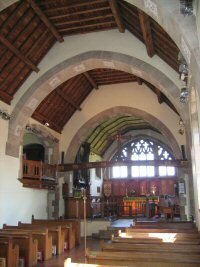 There is also the prospect of viewing one of Stonham’s major commissions, Stanton Prior. The visits will be led by Tim, now Planning Officer at Hastings Borough Council and Conservation Officer Jeff Collard; together they were responsible for the designation of the conservation areas that will be visited. The tour will be by coach from Guildford. A coffee break will be provided on the approach to Eastbourne, a ploughman’s lunch at Christine and Tim’s home in Eastbourne and the visit will end at a traditional village tea garden before commencing the return journey to Guildford. The Annual General Meeting was held at the Tilford Institute. The meeting was followed by an illustrated lecture by Dr Nigel Barker "Living in the real world? : working for English Heritage in 2005"
One of the commonest complaints about English Heritage is that it is a remote organisation, one not in tune with today’s world. In this lecture Nigel Barker will talk about the modernisation of the organisation, its new responsibilities for compiling and managing the forthcoming “National List” and his experience of working for a body whose strap line was “no one does more for the historic environment”. He will discuss the emerging national priorities and in particular how English Heritage is approaching the problem of skills shortages within the historic environment field. He will also explain its role in the planning system and illustrate some new initiatives in managing and sustaining our built heritage. Nigel Barker trained as an architectural historian gaining his Doctorate from Reading University in 1987. He first worked for English Heritage in the 1980’s compiling the lists of buildings of special architectural or historic interest for Surrey. Following a period as Historic Buildings Adviser for the County Council and then Waverley Borough Council, he rejoined English Heritage in 2001 as an Historic Areas Advisor for Kent, East and West Sussex. He is now Planning and Development Team Leader for Berkshire, Oxfordshire and Buckinghamshire. He is a founder member of the Institute of Historic Building Conservation, serving on its Council and is Chairman of the Editorial Board of Context, the journal of the Institute. The Lutyens Trust have once again kindly agreed that the Society may run an event at Goddards during their summer week at the house. Sir Edwin Lutyens designed Goddards for Sir Frederick Mirrielees in 1898-1900 as a place where ‘Ladies of Small Means’ might holiday away from the strains of work and enjoy the wonderful courtyard garden planted by Gertrude Jekyll. 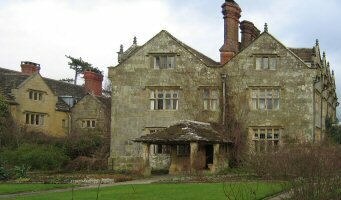 Goddards was given to the Lutyens Trust in 1991 and has been expertly restored by the Landmark Trust. The focus for the day will be a study of Japonisme, led by Beryl Joyce. The opening of Japan from its former isolation, by Commander Perry in 1854, brought an unexpected effect on European Art and Trade. Japan’s participation in the Great Exhibitions - London 1862 and Paris 1876 and 1889 - brought about what is now called Japonisme. Japan’s exhibits excited the artistic world, the craftsmen and the general public. Using slides of woodcuts, textiles, ceramics, architecture, interior and garden design, and with examples to handle and examine, the study day will show the effects and excitement of those times. Beryl Joyce is more than qualified to lead the day, she studied art history at the �cole du Louvre in Paris and researches and works in underwater archaeology with specific interests in ceramic finds; she has her own designated ship (wreck) ‘The Earl of Abergavenny’. Her life is spent researching ceramics and prints and more recently lecturing; one series of note is for the Far Eastern Painting Society at Morley College.